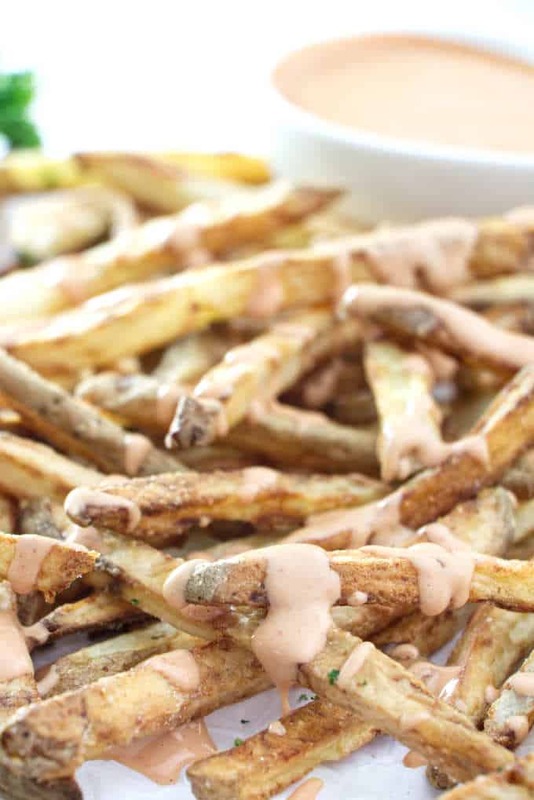 Stop dipping your fries in ho-hum ketchup and take them over the top with this Sriracha French fry sauce. I’m not exaggerating, this stuff is dangerously addictive so I need to warn you. You just might eat more than your share of fries when you start dipping them in this amazing sauce. It’s that good. You gotta dip your fries in this sauce! 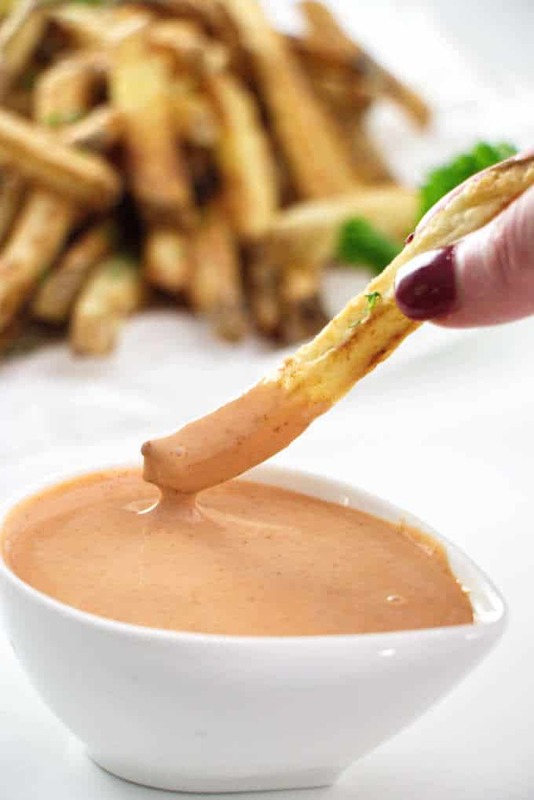 Even if you’re thinking that Sriracha has too much heat for you, you have got to try this French fry dipping sauce. If I had to grade the amount of spicy heat in this sauce, I would say it is about a 2.5 on a scale of 1 to 5. And that’s with 3 teaspoons of Sriracha. 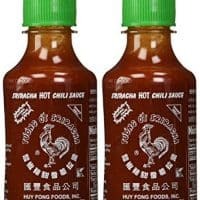 So if you’re not into “hot”, then dial down to 1 or 2 teaspoons of Sriracha and you will still have that ‘something special’ that can only come from Sriracha. And of course, if you can handle more heat, pour it on, baby! The Sriracha has the secret something that puts a special layer of flavor, zip, and kick into the sauce. It’s pretty much a mandatory ingredient in this recipe. 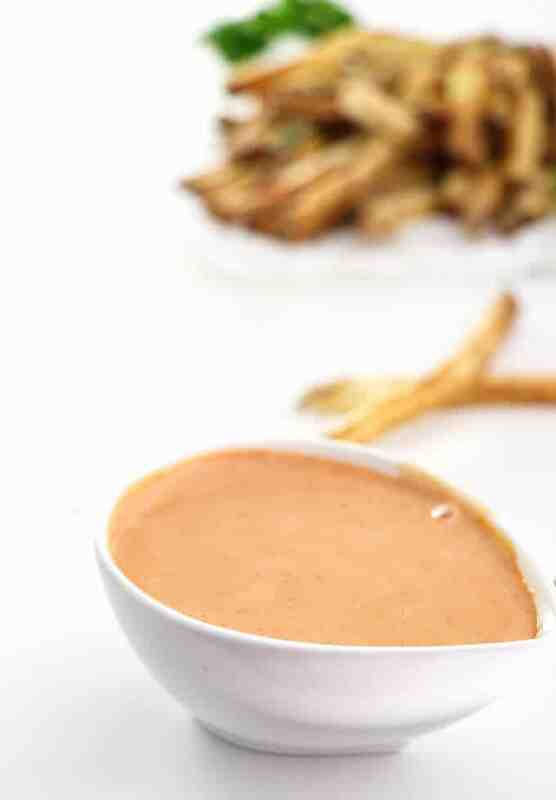 Creamy, luxurious sauce for dipping your fries! What can you use fry sauce for? 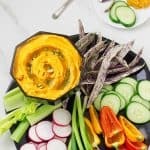 You have to make the switch from ketchup and dip your French fries, air fries, or sweet potato fries in this amazing dip. This creamy, dreamy, fry dippin’ concoction is also great as a spread for sandwiches, savory crepes, or hot dogs. It is the perfect ‘secret sauce’ for your next hamburger. And it is pretty amazing on shrimp tacos and grain bowls. Got sweet potatoes? It’s a sweet potato fries dipping sauce too. The options are endless, so make sure you whip up enough of this stuff for all the things. Sriracha fry sauce is going to satisfy all your taste buds. 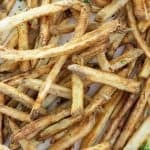 It has a little sweetness mixed with salty, sour, and umami flavors that will have you licking your fries clean. If you plan to make these air fries you are going to want something to dip those babies into. If you normally dip your fries into ketchup, you have gotta move over to this fry sauce. It’s a change you are going to love. You need this for your next batch of air fries or sweet potato fries. Drizzle that sauce all over the fries! What goes in fry sauce? 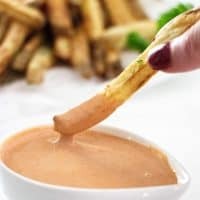 Fry sauce is mostly a mixture of mayonnaise and ketchup but it has a blend of ingredients that gives it a special twang. 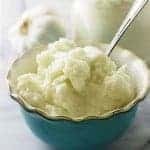 The mayonnaise is necessary for that ultra-creamy consistency and body but it’s the other ingredients that help it tap into all your taste buds. Our recipe has sriracha for an extra special zip! 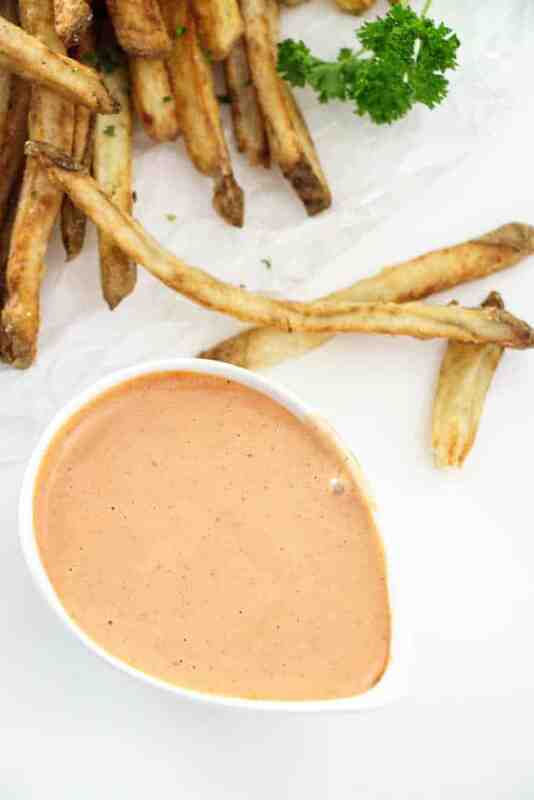 There are 6 ingredients in this fry sauce recipe. How long does fry sauce last? You can store this homemade fry sauce for up to 1 week if you keep it stored at safe temperatures. If you’re not using the fry sauce, keep it covered and stashed in the fridge. Can you freeze fry sauce? Do not freeze this sauce. If you freeze it, it will still be safe to eat but the texture and consistency will change. It simply will not have that luxurious silky smooth feel. This recipe makes less than 1 cup of sauce and takes less than 3 minutes to make. Just whip a batch up when you’re ready for it. If you think you will want extra then double the recipe but don’t freeze the sauce. The ultimate dipping sauce for your French fries! This Fresh Horseradish Aioli Sauce has a kick from fresh horseradish but it is not too overwhelming. Spanish Romesco Sauce is a little taste of Spain in a delicious rustic sauce. Lebanese Garlic Sauce is for garlic lovers only! This stuff is the most amazing garlic sauce you will ever taste and it is powerful stuff! Don’t stop at regular fries, this is a pretty incredible sweet potato fries dipping sauce too. We would love to hear how you use this addictive concoction. Drop us a comment below. Check out our video above and see just how easy it is to make this dip! An addictive finger-lickin' good sauce for your French fries. This fry sauce is exactly what you need for your fries but it also makes a special secret sauce for our burgers and sandwiches. Combine all the ingredients in a bowl and whisk together. If you need to stay gluten-free, choose a gluten free soy sauce. I could get in trouble with this sauce! Yum! Oh boy Karly, I totally get in trouble with this! It is so addictive! This looks terrific! Best dip ever for fries. Or anything! Nice recipe — thanks.